Don’t fool yourself into thinking you’re not one, because you probably are. The point is that you most likely can’t make your child succeed according to narrow, conventional standards, and if you do manage to do so, you may be crushing something else more important out of them. I remember a conversation with a very smart 20-year-old about his future when he said, “I just want to have a nice apartment in New York City.” And I thought, “That’s all? That’s what you want at 20?” In their efforts to ensconce him in security and some safe version of happiness or success, his parents had somehow pounded the spirit and desire out of him. Part of helicoptering is the fearful, anxious embrace of the comfortable bourgeois life that is making you anxious in the first place. 4. 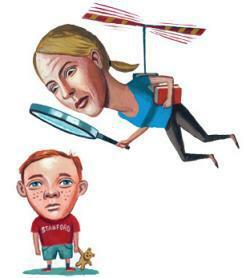 Helicopter parenting is about too much presence. Well, it is about too much presence, but it’s also about the wrong kind of presence. In fact, it can be reasonably read by children as absence, as not caring about what is really going on with them, as ignoring the specifics of them for some idealized cultural script of how they should be. It is the imposition of the parents’ fantasy of how they want their children’s lives to be. It’s the appearance of being busy and enjoying a rich or full life. As Levine points out, it is the confusion of overinvolvement with stability. You should hear what most kids say about this. … While you think you’re giving your kids everything, they often think you are bored, pushy, and completely oblivious to their real needs. But let’s look at this very simply: if you’re willing to give up your own life and identity, what is the message you have sent your kid about the value of other people, mothers in particular? It may be useful to remind ourselves that sacrifice is not a gesture that you make in front of a mirror: The recipients of this sacrifice may not take it in the spirit in which it is intended, and it may, in fact, harm them. 6. Helicopter parents are bad or pathetic people with deranged values. Actually, as both Warner and Levine point out, helicoptering, even in its more gruesome and dire forms, is generally the product of love and concern. It is not necessarily a sign of parents who are ridiculous or unhappy or nastily controlling. It can be a product of good intentions gone awry, the play of culture on natural parental fears.